Day 200: So Much to Look Forward to . . .
Well, well, well . . .isn’t that SPECIAL!!! Who could POSSIBLY have chosen THIS wine on THIS day? Could it be . . . ??? You remember the ‘Church Lady’ on Saturday Night Live? Dana Carvey was amazing . . . his timing, facial expressions, voice inflection – ALL were perfect! Finding humor in things seems to be a lost art. We’ve listened to and watched the likes of Bob Hope, Bill Cosby, George Carlin and Jerry Seinfeld and yet we still can’t laugh about life around us. It’s gotten to the point where PC doesn’t even come close to politically correct – or even personal computer . . . NO, instead it’s come to symbolize “Past Caring”. Yeah, kind of sad . . . there’s a large and GROWING population that is fed up with media, fed up with politics and fed up with excuses. There is a coming generation – our kids included – that are so disconnected from what’s going on in the world that it’s kind of scary. Imagine – millions upon millions of voting age adults opting to stay home instead of going to the polls to cast a ballot. Imagine – millions upon millions of voting age adults being turned off, tuned out and turned off by what’s happening in society. Imagine? It’s already happening . . . So, today–Jean set the alarm for 3 a.m. to be sure and watched the initial Mass celebrated by Pope Francis. Unfortunately, Brian was more like a bump on a log and didn’t make it out of the sack, but Jean was there through it all. And, as the Mass unfolded, perhaps the most telling and important comments came from Pope Francis himself – reminding that we need to take care of the poor as well as our own environment. As we’ve mentioned previously, we were both in college when JPII was ordained and his reign/tenure as leader of the Church coincided with our life together – how awestruck we were when, in 1999 while living in St. Louis, JPII came to our home city in JANUARY!! OK, in case you haven’t watched the Weather Channel lately, January in St. Louis is not exactly a ‘Carnival Cruise’! Actually, WINTER would be better than a CARNIVAL cruise!!! That year–and we’re serious – for the two days that he was in the city, the temperatures were in the 50’s and the sun was shining . . . Shortly after the visit, bitter cold, freezing rain and lots of wind – coincidence? We think NOT . . . just sayin’! 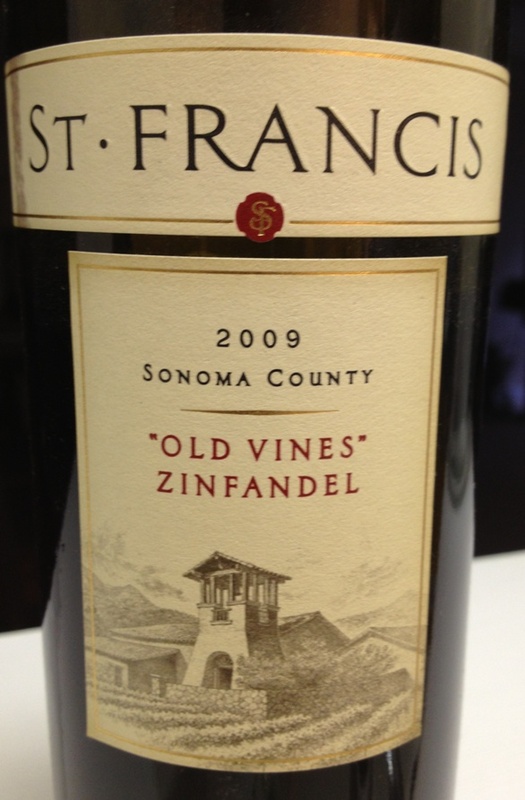 No coincidence that tonight we’d open a 2009 St. Francis Zinfandel from Sonoma County in California. Two things come to mind – first, isn’t it cool that we’re enjoying a wine from ‘St. Francis’ on the day that Pope Francis is installed as Pope . . . and secondly, how coincidental is it that our wine would end up with the same name as the new Pontiff – ok, must admit . . . planned. When at Twin a conscious decision was made to purchase this wine just for this day! A classic old vines Zinfandel that pays tribute to its heritage, this wine offered up a great nose . . . so spicy and truly pepper – a bit of cigar box, pepper and spice! The flavors on the front of the palate are cherry, vanilla, and tobacco. . the finish is a bit “puckery” but still full of flavor. Imagine this wine in a decanter to 1-2 hours? Yes, it’s got that kind of potential! For the price of $16 it is so very worth it!!! We decided this wine is much like our new Pope – calm looking on the outside – but once opened is full of spice, smooth and cordial, and full of a Bamn on the finish. Will be buying lot’s of this wine in the future. We know that not everyone is interested in or pays attention to things going on in the World. The Mass, celebrated by Pope Francis started around 3:30 a.m. today – our guess is that moost of America was asleep “at the wheel”, but there were a number of Americans that stayed up, got up or were awakened to watch History this morning. The Pope’s message is clear and simple – take care of those in need. This is something we can all get our arms around regardless of of faith. So, needless to say it was a historical day – a new leader of the Catholic Church installed – and we finished Day 200 – only 165 to go!!!! Please remember to enjoy your favorite wine responsibly and recycle whenever possible! Categories: Uncategorized | Tags: Austin, baseball, Church Chat lady, Dana Carver, Pope Francis, red wine, Saturday Night Live, St. Francis Old Vine Zinfandel, Twin Liquors, Zinfandel | Permalink.